Captain Daniel Merle started his sailing experience on the shores of Brittany, France. 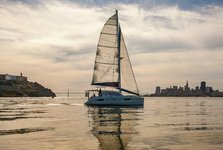 Over the past 15 years, in the San Francisco Bay, he has been an active sailor, going through all the American Sailing Association certifications and bringing friends on board to make them discover the San Francisco Bay’s beauty. In 2010, he joined the U.S. Coast Guard Auxiliary, patrolling the Bay with his shipmates, offering help and support to windsurfers, kiters and sailors. Captain Daniel is a French interpreter for the U.S.C.G.A. and a U.S. Coast Guard licensed Captain.